Rocky Mountains Drive: Wolf Creek Pass (Time Lapse) - In A Colorado Minute (Week 202) from Luci Westphal on Vimeo. A jaunty Rocky Mountains drive along Wolf Creek Pass (Highway 160 between Pagosa Springs and South Fork) in Mineral County, Colorado. I filmed this on our way back from Pagosa Springs (after visiting Four Corners and Mesa Verde National Park / UNESCO World Heritage site the day before) during week 200. On our way south we had driven through this area at night. In the darkness, we had suspected that the scenery was probably beautiful. We had no idea how stunning it would be during the day. When it comes to dimension and scale, both high and wide, I kind of don't think video really captures it like your eyes see it. But I hope this video gives you a bit of an idea why we kept saying "the journey is the destination" on this trip - even though our destinations, as you could see in the previous two videos, was amazing as well. The song in this video is the instrumental version of the appropriately titled "Drive, Baby, Drive" - written and performed by Jason Matherne. Find more of his music on SoundCloud. 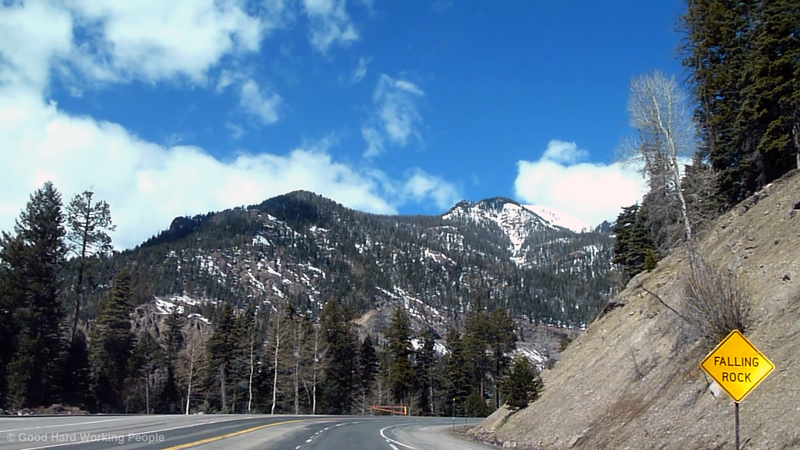 I plan on publishing a longer, unedited and slightly slower version of this drive very soon. Since week 200, I have changed the format of my weekly video series a little bit. I will continue to publish a 1-minute video every week. However, I will now not always use footage I shot that very week but sometimes footage I shot in a previous week. This is mainly because the sites in Fort Collins are a bit limited and I'm excited about exploring other places around this and the surrounding states. But because of work, I can't necessarily take road trips every week. So from now on, my Moving Postcard videos will function a little less as an updated weekly journal of my travels and explorations and be more focused on showing you the coolest places I got to see over the previous few weeks. If you have ideas of what I should explore and document for you within a day's drive of Northern Colorado, please leave a comment. Thank you!